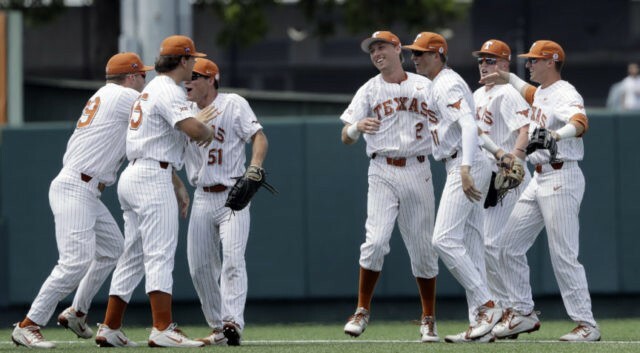 Texas and fellow Big 12 member Texas Tech won their best-of-three super regionals on Monday and became the fifth and sixth teams to advance to the College World Series. Kody Clemens homered for the third straight game and fill-in starter Matteo Bocchi held Tennessee Tech to one run in a career-high five innings as the Longhorns locked up their NCAA record-extending 36th CWS appearance with a 5-2 win in Austin. Texas Tech’s Gabe Holt, Brian Klein and Michael Davis homered, and the Red Raiders beat Duke 6-2 for their third trip in five years to the CWS in Omaha, Nebraska. The eight-team CWS field was to be filled out Monday night after South Carolina played Arkansas and Auburn met defending national champion and No. 1 overall seed Florida in Game 3s. Texas Tech’s Josh Jung went 4 for 5 and Holt, the Big 12 freshman of the year, continued his postseason tear by 2 for 4. Holt finished the super regional 7 for 12. The CWS opens with first-round games Saturday and Sunday. The NCAA was to set the weekend schedule after super regionals. North Carolina vs. Oregon State: Tar Heels are 1-4 all-time vs. the Beavers; all five meetings in 2006-07 CWS finals. Washington vs. Mississippi State: Bulldogs are 4-1 vs. Huskies; last meeting in 1998. Texas Tech vs. Florida or Auburn. Clemens will be the third member of his family to play in the CWS. His dad, Roger, pitched on two Texas teams that made it to Omaha and won the national title in 1983 before he went on to a major-league career in which he won seven Cy Young Awards and two world championships. Kody’s older brother, Kacy, was the first baseman for the 2014 Texas team that came within one win of playing in the CWS finals. The Detroit Tigers’ third-round draft pick and Big 12 player of the year led the 2018 Longhorns’ trek to Omaha. He’s batting .500 (11 for 22) in the NCAA Tournament with five home runs, two doubles and 11 RBIs. “We had five hits today and a season-low three yesterday. To be able to do that to this group of young men, I am honestly amazed, to be frank with you.” — Tennessee Tech coach Matt Bragga, on Texas shutting down the nation’s No. 1 offense.